According to Nokia recent press release, the Finnish mobile company is going to launch the white version of its Lumia 800 Windows Phone late this month. The white version of Lumia 800 will join the cyan, magenta and black versions of Lumia that were launched back in November. 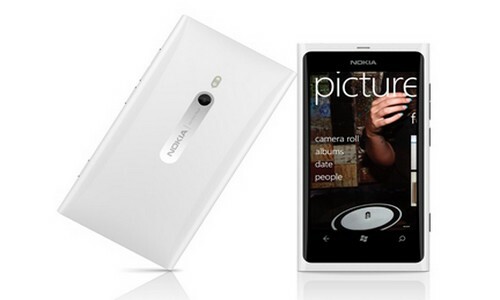 Just similar to its kin models, the white Lumia 800 will boast off a 3.7-inch AMOLDED ClearBlack curved display, a 1.4GHz processor, HD video playback, 16GB of internal user memory, free SkyDrive storage as well as an 8-megapixel camera with Carl Zeiss optics. Furthermore, the Finnish mobile company also planning to insert its Nokia Drive and Nokia Music apps along with a new Ministry of Sound app in order to make its Windows Phone range more prominent than the devices offered by its competitors. Initially the device will be launched in the United Kingdom, Finland, Russia, Italy, Germany, Switzerland, and Poland. The company has plans to extend the availability of its device to other regions later. While posting its fourth quarter financial results on January 26, the company claimed that it had sold more than 1 million Lumia units. However, the company didn’t reveal exactly how much Lumia 800 it sold.